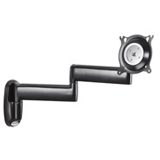 Chief KWD110B Dual Swing Arm Wall Mount provides a broad range of motion for viewing Small Flat Panel Displays from multiple angles. Folds in close to the wall for a low profile appearance. Perfect for home and office installations monitors. 1 x Screw, Button Head Cap, 5/16"-18 x 4"